After a long period during which planning was seen as an irrelevance or worse, the adoption of the UN Sustainable Development Goals 2016-30 gave it renewed importance. Goal 11 is to “Make cities and human settlements inclusive, safe, resilient and sustainable.” One of the Targets of this “urban goal” is “By 2030, enhance inclusive and sustainable urbanization and capacity for participatory, integrated and sustainable human settlement planning and management in all countries.“ This blog, based on a recent talk to PAS, looks at how planning fell from fashion for a long period, and what created the new international awareness that places need to be planned. In contrast planning was in the doldrums globally for 40 years between 1976 and 2006. The first UN summit on places was Habitat 1, in Vancouver in 1976. It came after a significant summit on environment in 1972, and the setting up of a UN Habitat and Human Settlements Foundation within the UN Environment Programme in 1975. The Vancouver Declaration produced by Habitat 1 put a strong emphasis on planning, 1970s-style, as a rational and directive process: “Planning should promote and guide development, not just control it”. It called on countries to prepare a national human settlements policy that would be integral to policies for economic and social development. It was downhill from there. The ambitions were not delivered. In particular, this style of planning floundered in the face of rapid urbanisation. Rational, comprehensive master plans took years to produce, were instantly outdated, and failed to come to terms with informal urbanisation. Furthermore, the Washington Consensus forced countries into deregulation and privatisation programmes. By 1996, when Habitat 2 was convened in Istanbul, few people other than planners were much concerned with urban planning. While I was there I visited informal settlements that were mushrooming around the edge of the city. Meanwhile, in the NGO forum in town, there were many single issue groups but few voices advocating for planning. The Istanbul Declaration proclaimed the aims of “Adequate Shelter for All and Sustainable Human Settlements”. Certainly planners could relate to these, but the main rationale for planning in the Declaration was that it could help markets to work better. By 2005 things had deteriorated. The catalytic event was the forced eviction of 700,000 people from informal settlements in Harare. The Mugabe government’s “Operation Clear Out the Trash” used the Regional, Town and Country Planning Act, and justified its actions in terms of planning principles, amenity and making the city beautiful. 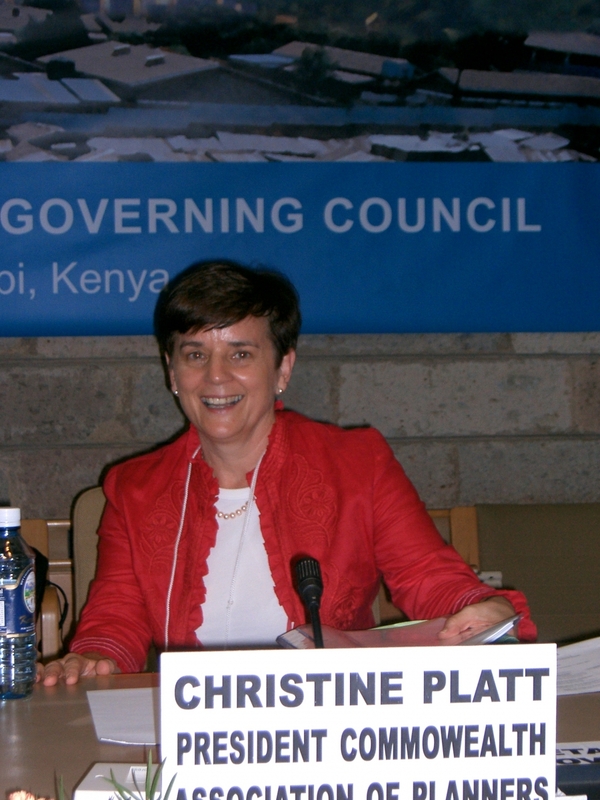 The Executive-Director of UN-Habitat produced a damning report. An academic commentator described the planners as “cold-hearted, negligent and spineless”. Rather than seeing CAP as a way of protecting and promoting the professional status of planners vis a vis other professions, I saw it as a vehicle for advocacy. Unlike any of the other international groupings of planners, it could feed directly into the political structure of the Commonwealth - 53 governments, across 5 continents, and representing a third of the world’s population. I coined the strapline “No sustainable development without sustainable urbanisation, and no sustainable urbanisation without effective, pro-poor planning”. I spoke at the 2004 World Urban Forum in a workshop organised by UN-Habitat. This led on to further discussions with senior staff at UN-Habitat. Together we identified the 2006 World Urban Forum in Vancouver as a unique window of opportunity. The theme of the WUF was to be “Sustainable Cities – Turning Ideas into Action”. This was much more suitable for the projection of planning than had been “Urban Cultures” in Barcelona in 2004. Furthermore, Canada is a Commonwealth country, and the Canadian Institute of Planners is a member of CAP, and was able to feed in ideas. Over a series of conference calls, hosted by the RTPI and the American Association of Planning as well as the Canadians, a strategy was worked out. There would be a high-profile international planning conference in Vancouver immediately before the WUF. CAP would bring delegates from a range of countries using funding won from the Commonwealth Foundation. We would draft a new Vancouver Declaration setting out the principles of a different way of doing planning. It would be signed by the representatives of professional planning institutes, committing them to international cooperation to “tackle the challenges of rapid urbanization, the urbanization of poverty and the hazards posed by climate change and natural disasters.” The intention was to lift planning out of its parochialism and see it as a way of addressing global issues. The short declaration would be complemented by a position paper for the conference. This was entitled “Reinventing Planning: A new governance paradigm for managing human settlements.” It spoke of New Urban Planning as being “pro-poor” and about social, economic and environmental sustainability. It was “not the physical planning or ‘town planning’ of the 20th century”. Reinventing planning would focus on reducing vulnerability to natural disasters, creating environmentally friendly cities, reducing new slum formation, building sustainable economic growth, and conflict resolution and safer cities. Ten principles were enunciated, stressing integration, inclusion and access to land, while also recognising variations between countries. It concluded by reaffirming Geddes’ focus on Folk, Work, Place. We also produced a book, Making Planning Work, which was launched at the WUF by the Executive Director of UN-Habitat. In the Foreword to the book she had written about it helping make “new urban planning an increasingly relevant contribution to achieving more equitable, just and sustainable cities worldwide.” Making Planning Work provided mini-case studies from all around the world to show that new skills and approaches were possible. CAP was then able to quote this statement within the Commonwealth. We were active at the Commonwealth Heads of Government Meetings in 2007 and 2009, and this resulted in further governmental level endorsements of planning and the idea of a state of the Commonwealth cities study, which was undertaken and published in 2010. Also in 2009 UN-Habitat made planning the theme of their biennial global report on human settlements. Not everything worked out as I had hoped. The Global Planners Network failed to reach out beyond its core of large planning institutes from affluent, mainly white countries; the chance to create a more powerful, truly global voice of professional planners was let to drift, though ISOCARP has become increasingly alert to these possibilities. Reinventing Planning and Making Planning Work were never really promoted to their members by the RTPI or the APA. The Commonwealth Foundation and the Commonwealth Secretariat were warned by the Department for International Development that they had to become more focused or lose their funding. As “urbanisation” was a new concern for them, it was dropped in favour of more traditional worthy issues like health, human rights, trade etc. Nevertheless, we do now have an urban SDG and a New Urban Agenda will emerge from Quito. UN-Habitat has produced a set of International Guidelines for Territorial and Urban Planning. These outputs reflect the hard work and lobbying of a small group of planners and urbanists from many countries. However, it is also clear that a number of trends were driving governments in this direction. At the time of Habitat 1 only 38% of the world’s people lived in urban areas; forty years later that figure is 54%. With the increase in population that has taken place, the world’s urban population has almost doubled since 1990, is now approaching 4 billion, and is expected to top 6 billion by 2050. Then there is the recognition of the economic importance of cities – already they generate 8% of global GDP. They are also disproportionate consumers of energy and CO2 emissions, and their locations on coasts and rivers leaves the wealth embedded in their infrastructure vulnerable to the effects of climate change. Last but not least we should recognise that China and many poorer countries led the pressure for an urban SDG, which finally overcame the resistance of the UK government amongst others.